We keep the transaction margins in trust custody account with Sumitomo Mitsui Bank so that the customers can trade with the sense of security. We keep the initial margins from the customers in a bank deposit with a domestic financial institution segregated from our own assets. Then we add and subtract realized and unrealized profit and loss including swap points and trust custody the net amount with Sumitomo Mitsui Bank. Assets in trust custody are immune from compulsory execution, provisional seizure and provisional disposition etc. by the creditors if by any chance our company becomes bankrupt. Therefore transaction margins belonging to customers will definitely be returned to each customer from Sumitomo Mitsui Bank through the beneficiary surrogate even if our company faced payment suspension or bankruptcy etc. Transaction margins belonging to customers will be returned by following procedures. The company faces payment suspension etc. Sumitomo Mitsui Banks returns effective retention money in the trust account to the beneficiary surrogate. The beneficiary surrogate performs calculation of the effective cash and identity verification of the customers. After the identity verification of the customers, the beneficiary surrogate returns the corresponding portion of the effective retention money to each customer. ※This trust scheme covers yen cash only and not the foreign currency of the customers. ※This trust scheme does not guaranty the transaction principal. Depending on the foreign exchange rates and CFD prices, there is a possibility of loss above principal amount occurring. ※Trust deposit does not take place on real-time basis. Required trust amount is calculated every day and trust deposit for effective retention amount is made within two business days from one day after the calculation date. Therefore there is a time-lag between the time of receipt from the customers and the time of trust deposit made. So there may be some difference between the effective retention amount at the time of receipt and at the time of return. ※In the unlikely event of bankruptcy at our company, the margin deposits would be returned to the customers from the beneficiary surrogate with the effective retention amount as the upper limit. But in the process, the identity certifications of the customers are required and the personal information of the customers may be submitted to the beneficiary surrogate and Sumitomo Mitsui Bank acting as the trustee. 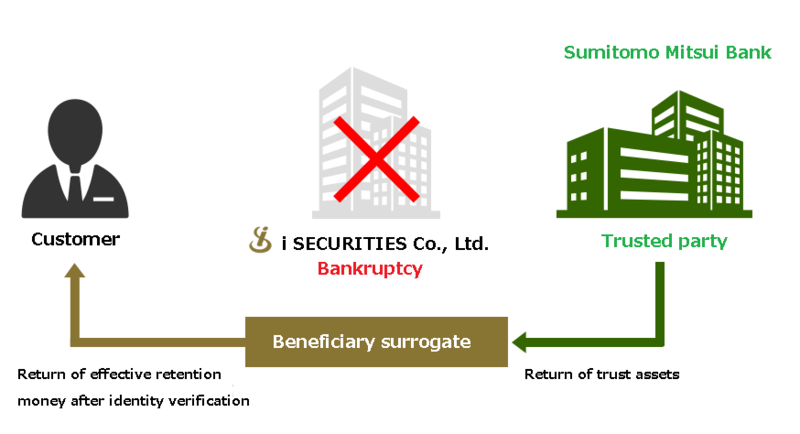 ※Sumitomo Mitsui Bank acting as the trustee does not guaranty the return of the trust assets to the customers and has no management responsibility over the operations of the beneficiary surrogate.